Last year, on December 5th, a young man was shot and killed by a police officer at the Hollywood & Highland intersection, right around the corner from my Los Angeles apartment. This happened in a flurry of news stories of other cases of US police using deadly force. 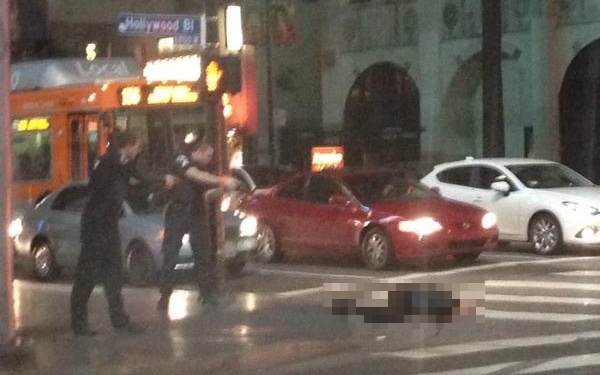 With the news came several disturbing photographs, including aphoto of two police officers pointing their guns down at the man’s dying body sprawled out on the Walk of Fame. I experienced a powerful wave of complicated emotional response. Images of riots, tear gas, guns & ambulances flashed through my mind. It was overwhelming. I felt my heart cave in. I immediately fell to my knees in prayer, tears streaming down my face. This is bigger than gun laws and law enforcement, bigger than Hollywood, bigger than racism. When things like this are happening, it is an indication of something nefarious about the world we are living in, about the health of our culture, and about the future of the reality we are creating together. Earlier this week, a similar incident took place. Yet another young man was shot and killed by a police officer –this time, in Venice, right around the corner from Full Circle Venice, a very cool local community center. I’ve been facilitating meditation classes there regularly since they opened a year ago and have developed a deep fondness, love, and appreciation for the community and culture of Venice Beach. The young man killed this week was named Brendon Glenn, and he was a part of that community. Andrew Keegan, founder of Full Circle Venice, participated in vigils, protests and community meetings regarding the shooting. This week, Venice has been distraught and restless. This time, I am experiencing a different kind of emotional response. Yes, I’m feeling a familiar combination of heartbreak and disappointment, anger and frustration; but this time the context is much greater. This is not only a redux of something tragic that seems to keep happening, but it seems to keep happening here. This triggered a sense of increased urgency & responsibility, a tone of heaviness & importance. The only way this can create something positive is if it impacts and inspires us – we have to choose to allow it to. I will allow this to impact me. I am allowing this to inspire me to take action, to change. I will stand up and take my life more seriously. I will interact more intentionally with society. I will participate in the greater narrative moving history. I will pay attention. I will find a way to contribute. This time, I will do more than pray and hope for the best. Will you join me? Will you allow this to impact you, too? Will you also interact with this world, stand up and take life seriously? Will you participate? Will you pay attention and find a way to actually contribute? Will you do more than just pray and hope for the best? We co-create this reality that we experience together, and we can only create change together. The world does not need to be how it has been all along. We have the power to change everything, and we all have a role to play. Our purpose in life is highly individualized (to say the least) but no one is left out of this conversation. Don’t feel small. Don’t feel insignificant. Absolutely every individual alive today has the power to impact future forever. Don’t waste time holding back or hesitating. The world is transforming, and not only do we have front row seats, we get to participate and co-create what the world will become after the transform. I’ve designed a meditation (see video below) to help facilitate the conditions for insight. This can be for anything, but was created with the idea of aligning with a greater purpose, perceiving a bigger context, and living a more meaningful life. This meditation is self-guided and self-directed – great for all experience levels. Any meditation is what you make of it. The deeper you allow yourself to go, the deeper you will go. Surrender to the experience. After the meditation, journal any insight. Sit in a comfortable position. Close your eyes. Take a few deep breaths. Take this moment in. Don’t rush it. Allow your thoughts to pass through your mind – don’t judge them, and don’t engage them. Just let the thoughts play themselves out, and continue your controlled, deep breaths. Breathing deeply dilutes stress hormones that could be coursing through our veins. Alert stillness is a beautiful, important aspect of meditation. Any energy that would be dissipated by fidgeting is conserved in the stillness. Allow yourself to relax, letting go of your mental to-do list, bringing all of your awareness within. With a deep breath, allow mature solemnity and innocent sincerity to wash over your heart and mind. Dedicate this moment to all that is Living, Loving, Good, Beautiful and True in the universe. Allow that conserved energy to flow naturally through your body to where it is needed most. Give a few more moments to breath and stillness. Contemplation is fertile soil for insight. Contemplation helps us understand, and understanding helps us become. Contemplate your greatest expression, your best self. Contemplate opportunities to interact with the world in a more meaningful way. All this and more. Receive it now. Give a few more moments to breath, and to stillness, allowing insight to flow through. When you’re ready, open your eyes, check back in with your body, and begin the transition back to your day. As we move forward down the individual paths appointed to us, we do so transformed, revitalized, and ready for anything.